Link to one parent blog from New Zealand on the subject (a blog I really recommend), another opinion from another parent here (US, a bigger blog, I believe). Also here an Update of the comment policies on “The Thinking Person’s Guide to Autism” following some escalated comment threads on their facebook page. I am really happy to know that I have autistic adults reading and liking my comics and words here and I am glad to say I read some excellent, down to earth and thoughtful Australian (ASD) parenting blogs too, on a regular basis (blogroll soon) So Peace, people, FFS! It’s kinda important. Happy New Year, also. 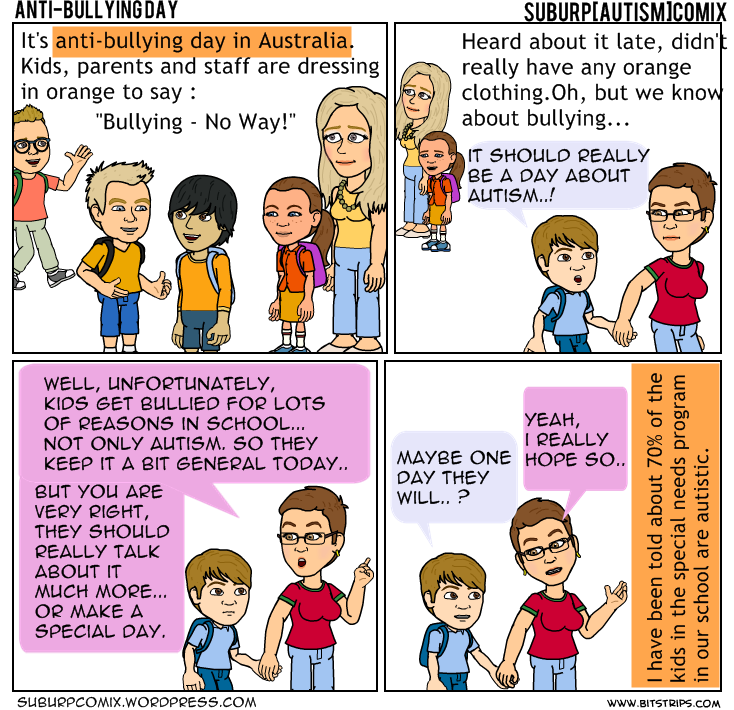 This entry was posted in Australia, autism, general, parenting, Sh*t people say about autism and tagged ADHD, ASD, asperger's, autism advocacy, autism community, autism parents, autism wars, awareness, flaming, insults, online behaviour on January 5, 2014 by starfish. A little postcard from Australia! 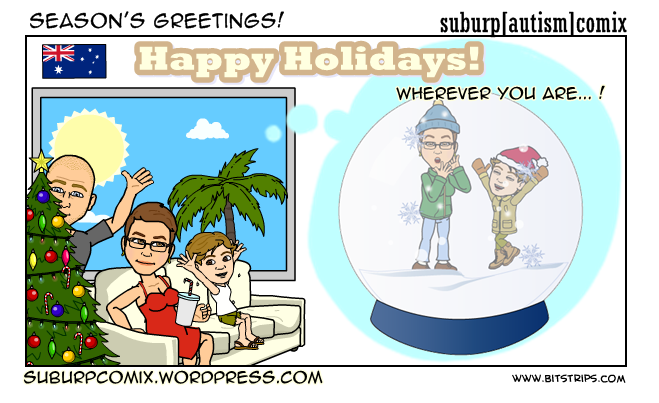 A bit paralysed by a heatwave that is hitting Queensland right now (the ‘White Christmases’ of my childhood really quite a distant dream…) I wish everybody a good holiday season. Whatever you celebrate, and how, and with who and most importantly where – all our best wishes for you and those that you love! We will leave the ‘reflections on the year that was’ and ‘good resolutions for 2014’ to the news channels and social media outlets I think, but I do want to let you know that I feel really HONOURED that so many people are following my blog (80+ via wordpress! yee-haa!) , have commented (you know who you are !) and have shared posts (yesss!!) ! It’s a great encouragement and makes doing the comics even more fun! 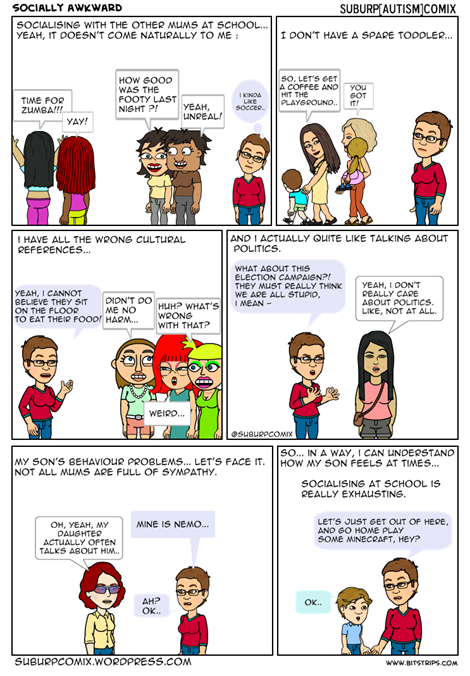 Like almost everything in my life, this blog had a bit of a rocky start (bitstrips suddenly exploding via their apps and my computer being somewhat ‘unwell’ lately) but your reactions make me think that I am onto something and I really feel like I have made a few new friends! 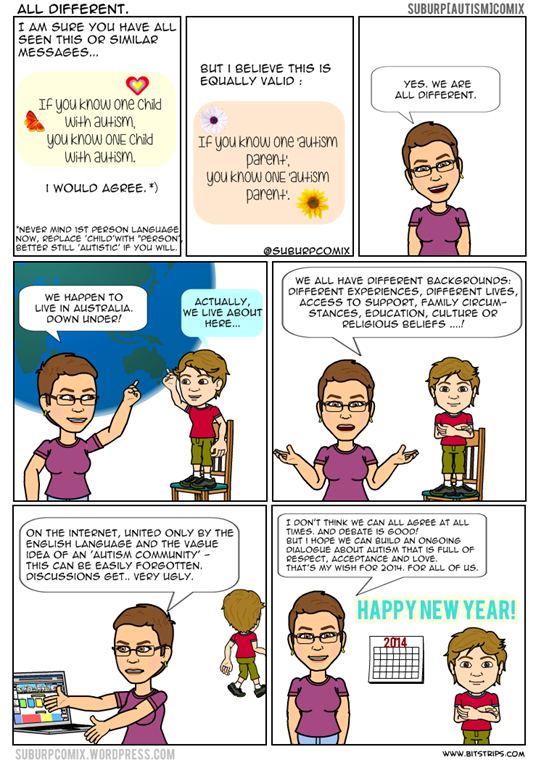 This entry was posted in Australia, autism, general, parenting and tagged ASD, autism, autism advocacy, autism awareness, autism awesomeness, autism myths, bitstrips, blog, blogger, parenting on December 24, 2013 by starfish.